This is the ULTIMATE tailgate grill. 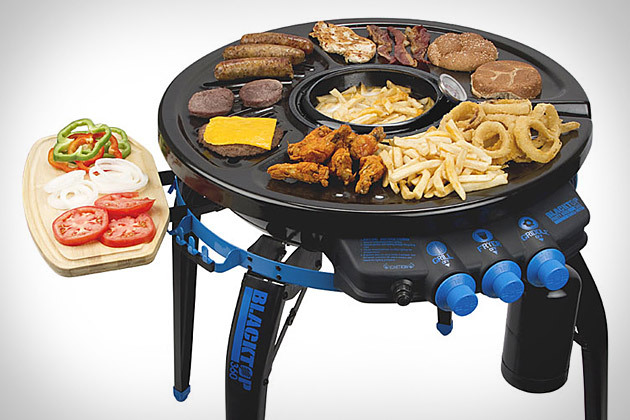 The Blacktop 360 ($250) has the capability to grill and griddle, along with a warming plate and a deep fryer. It has an "infra-red heat source", which just means it gets really, really hot. Hot enough to cook a bacon-wrapped, filet mignon in just minutes. (Don't judge. It's called "Stylish Gameday" for a reason.) The game changer, of course, is the deep fryer. Because what goes better with a steak, then crispy, salty, truffle fries? The 360 is the perfect circle of life - tailgate perfection.